What are carbon nano tubes (CNT)? As you can see from the figure all the allotropes have different arrangement of atoms. For example, in case of diamond, the hardest element found on the earth, every single carbon atom is linked or bonded (covalent bond) with every other 4 atoms of carbon. Likewise, carbon nano tubes are a one of the allotropes of carbon where every carbon atom is linked with every other three carbon atoms and also form a cylindrical structure. Carbon nano tubes are man made. The graphite and diamond are alone the naturally occurring allotropes of carbon. 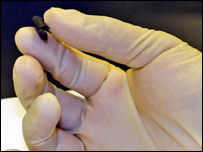 A paper battery is a flexible, ultra thin energy storage device made of cellulose (paper) and Carbon nano tubes. A paper battery can act as a super capacitor and also as a high – energy battery. Anode and cathode are the metal electrodes in the battery. The electrodes are placed in the battery in such a way that, they are in contact with the electrolyte. When an external load connected to the battery circuit is closed, current begins to flow because of the electro chemical reactions occurring inside the battery. Oxidation and reduction are the two main electro chemical reactions happening in any batteries. Oxidation takes place at anode and reduction takes place at cathode. Anode loses electrons to the ions from the electrolyte to form a compound and hence is said to be positively charged. Cathode gains electron from the electrolyte to form a compound and hence is negatively charged. What is the role of the separator? The separator separates the anode and cathode. The batteries have to be very compact in size for the ease of use and hence the cathode and anode are closely packed. The separator acts as a barrier preventing the anode and cathode from touching each other. When they come in contact there will be no flow of current in external circuit. On the other side a thin film of lithium is laminated. Aluminium rods are connected for carrying current. I am Subhashini. I am an electronic design engineer, an alumni of IIITDM, IIT MADRAS. I like reading books. Sandra Brown, Johanna Lindsay, Paulo Coelho, sophie kinsella are my favorite writers.I also like learning languages. I am fluent in english, tamil, hindi, telugu and malayalam.I can read, write and understand german. I am learning japanese. I am also doing B Sc(psychology) with Madras University.